Over the weekend 8th to 10th May Telstar Scouts attended the annual Benelux and Scandinvia District Camp held at De Kluis in Belgium. Whilst on their way to a first aid base in the woods, 8 Scouts came across an elderly man lying on the floor with erratic breathing and unable to communicate. The man (a 62 year old local Dutch national who has mental health challenges) had been walking in the woods with his carer when he suffered a heart attack. The man's carer covered the man with a blanket but had to leave him alone as she could not get a mobile telephone signal deep in the woods of De Kluis and she desperately needed to get medical assistance. Upon finding the casualty, the Scouts first checked if he was breathing and then immediately despatched half of their patrol to run-on to the first-aid base to get a Scout Leader’s help. 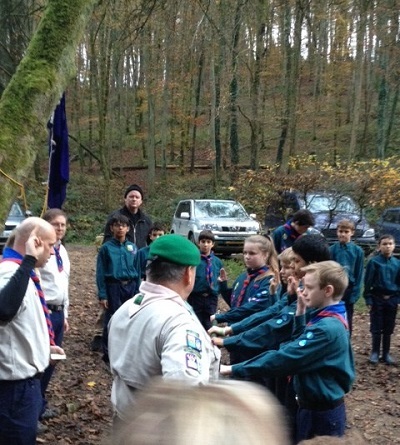 The other Scouts stayed with the casualty to ensure he was not frightened and kept breathing. A Scout Leader immediately ran with the Scouts to give first-aid assistance to the casualty. The ambulance and a paramedic were called. Basically the alert had been raised even before the gentleman's carer could get mobile phone reception. What was most impressive was that the Scouts made a human chain through the woods to the main road, so as when the emergency services arrived they could guide them in. In making this chain, all 8 Scouts stood about 300m apart from the scene (which was deep in the woods and on paths that vehicles could not enter). Nearer to the main road they found cars parked and blocking the route, they informed drivers to move their cars and ensured the route was kept unblocked. Upon arrival of the emergency services and the paramedics, the Scouts quickly guided them to the scene and stayed in their human chain format to ensure the emergency services could quickly get out of the woods. The doctor who attended the scene informed that the man's vital statistics were critical and without the fast action of the Scouts to raise the alarm and ensure clear guidance of the emergency services, the casualty would not have stayed in this world for very long; in fact, the doctor said the Leaders and the Scouts had saved his life. Both Telstar Scouts, Yul Hendersen and Oscar van Bommel, will be given Certificates of Merit for their good conduct, devotion to duty and their bravery at the Telstar AGM on 18 June.